When the Hilton’s Marcom manager Sunday asked me if I would like to review their Horizon restaurant’s promotion of Oysters and Bubbles, how could I say no? Both my weaknesses at the same time! I ask you! The Horizon is the Hilton’s top venue in many ways. On the 34th floor there is nothing above you, and it is their top, most exclusive venue. Actually, Horizon has two sections – the outside bar with the incredible views of Pattaya Bay and the inner section behind glass, with several private dining rooms, also glass walled where you can sit and enjoy the lights along Beach Road, right through to the winking “Pattaya” sign. The evening was worth it for the strawberries alone! We went straight to the Oyster and Bubble promotion which features a set of fresh oysters served with seafood dressing, shallot vinegar and fried shallots, and two glasses of French sparkling wine. 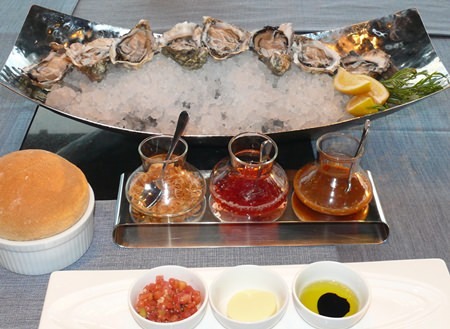 There are two options on offer; a set of six Fines de Claire oysters with two glasses of sparkling wine for B. 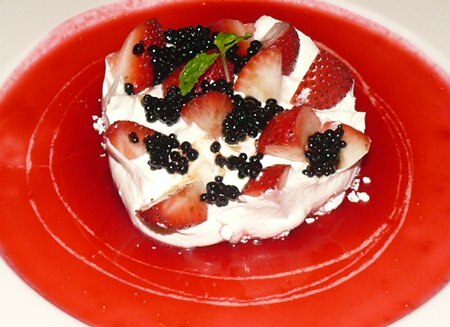 1,350 or a set of a dozen Fines de Claire oysters with two glasses of sparkling wine for B. 1,950. We restrained ourselves and stuck with the 6+2 option. The sparkler is a Nos Amours, from Bordeaux, and is described as “a wonderfully quaffable fizz for any occasion with aromas of butter and cake. A fresh and harmonious sparkling wine.” For me, even though the label proclaimed it as a Brut de Brut, it was pleasant, went well with the Fines de Claire, rather than being memorable by itself. The Oyster and Bubble promotion features Fines de Claire oysters. Right from the outset, mention must be made of the serving staff. Beautifully outfitted, gracious, charming and knowledgeable, able to explain the dishes with all the complexities that some of them had. For example, we began with seared Japanese sea scallops which had sautéed calamari noodles and Portobello mushrooms, truffle-crustacean bisque, sundried cherry tomatoes and black truffle. They were beautiful, with very plump and juicy scallops. 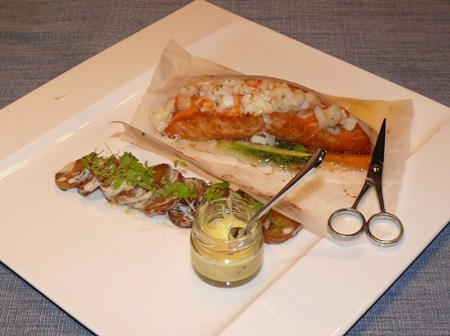 The Atlantic Salmon “En Papillote” consisted of Atlantic salmon cooked in a very delicate filo parcel which our ever-attentive service girl snipped the end off so we could get to a large salmon fillet inside. 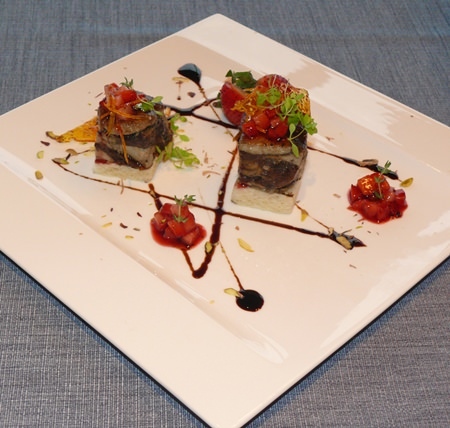 From that dish we ventured into a Foie Gras “Brulee” which featured goose liver and prune terrine base topped with a contrasting layer of hard caramel, strawberry, thyme, black pepper salsa, brioche and balsamic reduction. Executive Chef Supoj must have had fun dreaming up that dish. The next was one that we both found exceptional, a rock lobster on risotto, fava beans, snap peas and fennel salad. I am not one who is partial to risotto, but this one was excellent. I had to restrain Madame from licking the plate, it was so good. 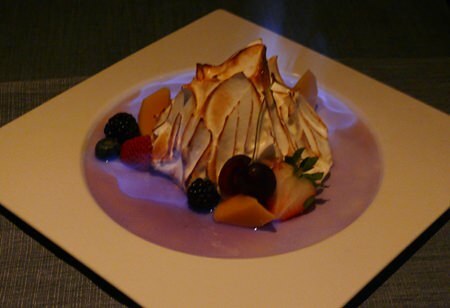 Needless to say, the desserts were just superb, with a baked Alaska flamed at the table with ice cream meringue and kirsch cherries for Madame and an amazing “Sweet Caviar” for me which had balsamic caviar, goat cheese panna cotta, soft meringue with Grand Marnier strawberries. The evening was worth it for the strawberries alone! There is no doubting that for a special occasion, Fines de Claire oysters are hard to beat; however, as far as the Dining Out team is concerned, you can make any evening a special one by enjoying the Oyster and Bubble promotion (which will not be an everyday feature, so if you enjoy Fines de Claire, as we do, then make a booking soon). 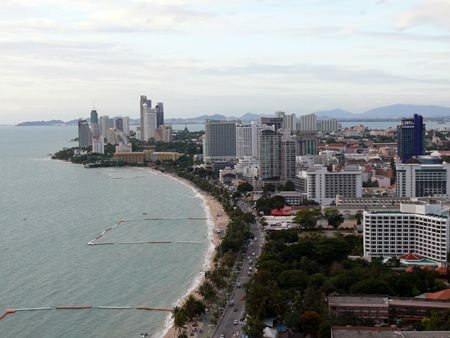 Horizon offers incredible views of Pattaya Bay. 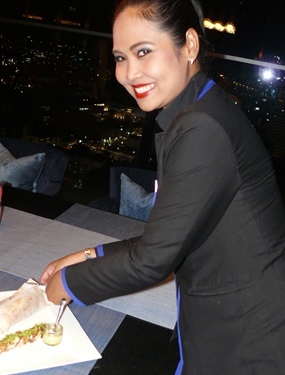 Horizon Restaurant, 34th floor Hilton Pattaya, above the Central Festival center, Beach Road. Open seven days with the outside bar open at 5 p.m. and dinner 6.00 p.m. until 1 a.m. Dress code smart. Valet parking available. Booking recommended 038 825 3000.